Picturesque Sparks Lake Oregon, situated 25 miles west of Bend, offers excellent trout fishing as well as spectacular views of Mt. Bachelor, South Sister, and Broken Top. Hike the scenic Ray Atkeson Memorial Trail, named after the famous nature photographer. Known for excellent cutthroat and brook trout fishing. Just 25 miles west of Bend near Mt. Bachelor. Enjoy spectacular views of Mt. Bachelor, South Sister, and Broken Top. Located in the heart of beautiful Central Oregon just 25 miles west of Bend, Sparks Lake is a large, shallow lake. Situated near the northwest edge of Mount Bachelor, the lake boasts spectacular views of Broken Top and South Sister in addition to Mount Bachelor. 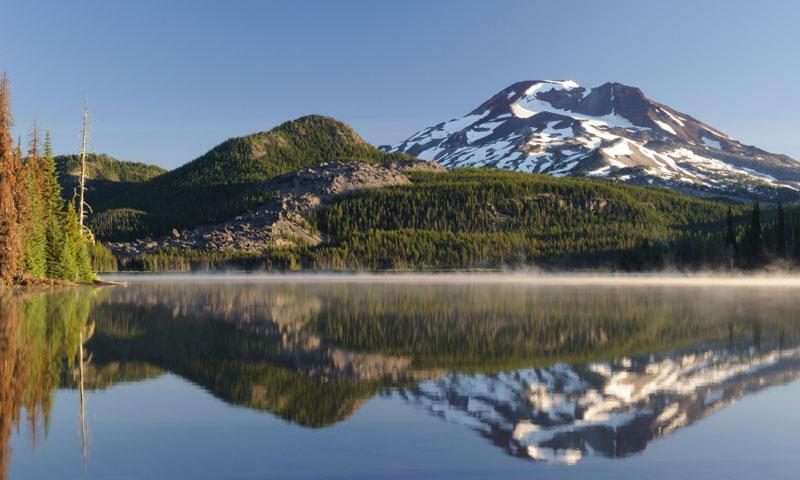 Sparks Lake was formed by volcanic activity in the area over 10,000 years ago. Pristine alpine streams flow into this beautiful lake, providing a variety of recreational activities including kayaking, canoeing, and fishing. Sparks Lake, OR, is only 25 miles west of Bend and is accessible via the scenic Cascade Lakes Highway. The road is usually closed due to snowfall from mid-October until late May. Deschutes National Forest, 1001 SW Emkay Drive, Bend, OR 97702. Phone: 541-383-5300. Visit the website here. Fishing – Fly fishing is the only type of fishing allowed at Sparks Lake, which has both brook trout and cutthroat trout. Fishing is especially excellent just after ice-out - the lake can be accessed during that time via skis or snowshoes. Hiking – The Ray Atkeson Memorial Trail, named after the well-known nature photographer, is an easy 2.3 mile hike that takes you past the lake through breathtaking alpine scenery. The best time to hike this trail is from the end of June through mid-October. Submerged lava tubes transport water from the lake to the Deschutes River. A shallow lake, the maximum depth is only 10 feet. The surface elevation of Sparks Lake is over a mile at 5,433 feet.